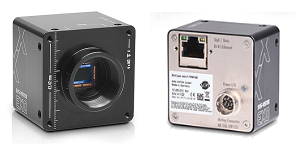 This GigE Vision Ethernet camera features the Sony IMX174 sensor to deliver 1920 x 1200 resolution at up to 49 frames per second. SVS-Vistek calls their EXO series cameras “the integrator’s camera,” and they do so with good reason. Most EXO cameras are built on Sony IMX Pregius sensors offering excellent dynamic range and efficiency with a high signal-to-noise ratio. These cameras deliver all the imaging control you would expect, plus a surprising amount of I/O functionality. Being Genicam compliant, most machine vision software platforms can easily communicate with EXO cameras. And, for those that prefer to develop a custom application, there is a free SDK. The EXO series cameras have a precision-machined 50 x 50 mm IP40 aluminum body. The unibody housing ensures excellent temperature distribution, enabling today’s image sensors to run cooler. The rigid lens mount keeps lenses properly positioned to maintain sharp focus. There are mounting holes on five faces of the housing, plus a standard 1/4-20 tap on the bottom for attaching a tripod. The housing includes a multi-color flashing LED that indicates camera status. This GigE Vision Ethernet camera has two trigger inputs plus an optically-isolated input. There are four outputs. There is also an RS232 input (RXD) and output (TXD). Inputs use Schmitt triggers for better noise immunity. Both inputs and outputs support discrete 24 VDC. The camera’s inputs offer unusual functionality. They can be configured to debounce inputs, control timing of camera operations and output signals, and control four independent pulse (PWM) generators. Timing functions can be programmed with a resolution of 15 ns. A pulse divider lets you take an action on every nth signal, where n is a value between 1 and 15. Logic gates (AND, NAND, OR, NOR) combine signals to make decisions. A built-in LED driver will deliver up to 3 amps to an external light. High-frequency PWM functionality enables the camera to control light intensity.